Ok I can tell that the standard is the starting point. But where do the other versions fall in as to price? Or do they follow a Stern method of pro, premium, le? Assuming yellow brick road will be above RR or match RR. What's the difference between the green one and red one besides the obvious? Those are the 3 official (at this time) releases to the public games. All 3 games are identical for gameplay, but different in cosmetics. Emerald City was the first release from JJP. It featured a direct print cabinet, wooden apron, emerald green armor. Unless they upgraded the light boards, these will most likely be the ver. 1 boards. Invisiglass, shaker motor included. Standard Edition - stainless steel armor. standard glass, no shaker (but can be added). metal apron. At this time only a very few distributors have even the 75th on hand. Best thing to know is that any game with a production date of 12/15/16 or newer will have the 2.0 light boards in them. I would put the ECLE at the top due to the direct printed cabinet and clear coated wood apron which isn't on any of the newer models. RR's sometimes go for more though as they are newer and some people want games with 2.0 light boards. Most ECLE games have 7.5v light boards and have never had an issue. Personally I think the WOZ ECLE is the most beautiful pin ever made in part due to the metallic green armour and habit rails, wood clear coated apron, and direct print cabinet. red - decals on the cabinet, metal apron, red armor, red tinted backglass, could have 2.0 boards from the factory. There are other "Green edition" games out there that just have all the trim and habitrails powder-coated green, they don't have the wood apron or direct-print cabinets and I don't believe they are considered "official" JJP versions of the game. If looking at the secondary market keep in mind that not all 75th RRs shipped with invisiglass and printed manual, these were added at some point when the price was raised $500. The owners may have added the Invisiglass but it wasn't standard before that. I have ECLE with the modified 5.0 boards with the added buffer board and have not had any issues in over 3 years. If you have 5.0/7.5 boards and you haven't had an issue, that really should come with a "yet" at the end. If you've had the game for 3 or 5 years it doesn't really matter. It doesn't seem to be a time factor but a games played factor. I don't think we've seen any WOZ games with a few thousand plays on them with 5.0/7.5 boards that didn't have a board go out? I've searched for such an example, but haven't found one, so if anyone has one please share! In my searching there were a fair number of used HUO buyers that have been burned on the old boards, buying from users who had their pin for years and never had problems, only to play a bunch of games and then have boards go out. It's just too much of a risk for me, unless the prices become more reasonable for that risk. 2.0 boards are the only ones that are truly 100% to last as long as any normal LED board should. I'm in the market for a WOZ myself right now, but the prices on HUO are too high given that 2.0 boards are $800 and about 12 hours of work to install them. My personal Emarld City Woz with original 7.5 boards had thousands of plays on it from years of going to shows and in tournaments. I never ONCE changed out a board. 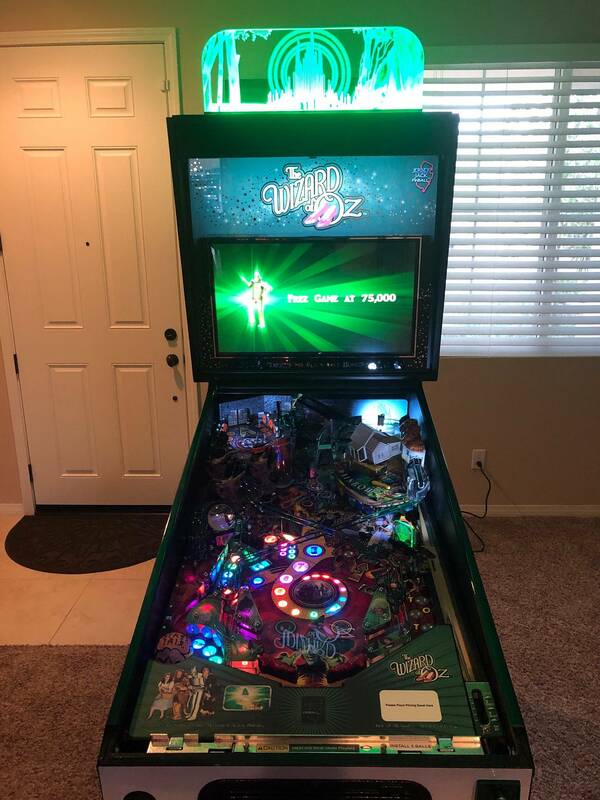 I have sold this machine and the new owner did decide to go with the 2.0 kits (since i had it already), but that being said, I never had an issue with the original board set. Well I trust you completely, so this definitely gives me food for thought then. This is really great to know, I wonder if there are more then too? Are there issues with the clear coats on some of the earlier playfields? I have a emerald somewhere around the early 800’s 7.5, no issues with it. I paid 300 for the complete set of the upgraded 5.0 boards , the tech at JJp said that voltage was not the issue. Something to do with static electricity that the added buffer would eliminate. It does not take 12 hours to change out all the boards, it took around 3 hours only becouse changing out the boards under the mini playfield was a pain. It’s ironic in JJP’s case, but the standards are really the most limited and least produced. The standards with the direct print cabinets are the rarest of all of them IMHO. The ECLE is the best looking one. The RR is probably the most reliable from the factory. The rarest version for U.S. buyers is the Emerald City Edition with custom topper and exclusively found at Automated Services. This version includes Invisiglass and shaker. What are the extra toys? This model looks beautiful and it has the 2.0 system installed. Agreed. I like it better without the wood apron. Really it’s personal preference...the ECLE will make you drool though, it really stands out and draws you into it. I’m curious to see how the YBR will look. Thanks for the input. I will know what to look for when the time comes. Nobody has any idea what the Yellow Brick Road version is going to be? Same everything just different cab decals? What the over under on it be announced or even displayed at TPF? The 2.0 boards are not going to be failsafe. The (ALL) LEDs go out eventually including the 2.0 LEDs and anything Stern or other manufacturers use. The main thing the 2.0 system offers over the 7.5 buffered boards is a non-series configuration so if one goes out it does not take all the LEDs down the stream out until the bad one is bypassed. I also would guess the brand of the LEDs is likely still the same and only the version is changed because they stop making the previous version every so often. I think it was Kingbright. I also would guess the brand of the LEDs is likely still the same and only the version is changed because they stop making the previous version every so often. I think it was kingbrite. Nobody knows, only rumors. Based upon the number of issues people seem to have with the monkey mech, the rumor is that it will be either redesigned better or just removed altogether. I am thinking it will be announced at TPF. For the monkey, my only advice is to put some lubricant every once in a while, my monkey started to have issues, he was louder than usually and wasn't picking up balls all the time. I cleaned it and put some lubricant, he works like a charm now. Speaking of lube, I also lubed the witch mech, and thought it would be a good idea to lube the castle doors but I have no idea what to lube there. Personally, I wouldn't touch any model WOZ without the new lighting system as I had to change out my ECLE's whole 7.5 lamp board set not once, but most of the boards twice and some of the boards failed a third time. I know a person that had their game in the same shipment as mine and has not encountered one lamp problem. Build date was Fall 2013. Two of the four ECLE's in that same shipment had lamp board issues, the other two nothing. I know some guys with RR WOZ games that currently have lamp problems, so in my mind the best thing is buying a WOZ with the 2.0 lamp kit installed, anything else is a crap shoot.